Resindion Srl has been manufacturing Ion Exchange resins for several decades. Their core product line is the methacrylic based resins. These resins are highly rigid and do not swell significantly in solvents or various buffers. The rigidity also allows for faster flow rates and deeper beds for optimum separations. In addition, these methacrylic polymers are hydroxylated to increase the hydrophilicity of its base matrix therefore maximizing the functional exchange of the resin. 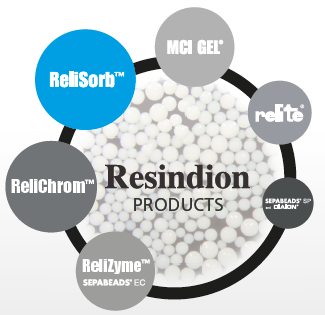 Resindion Srl offer such products in various particle sizes and pore sizes to give its customers the optimal resin.